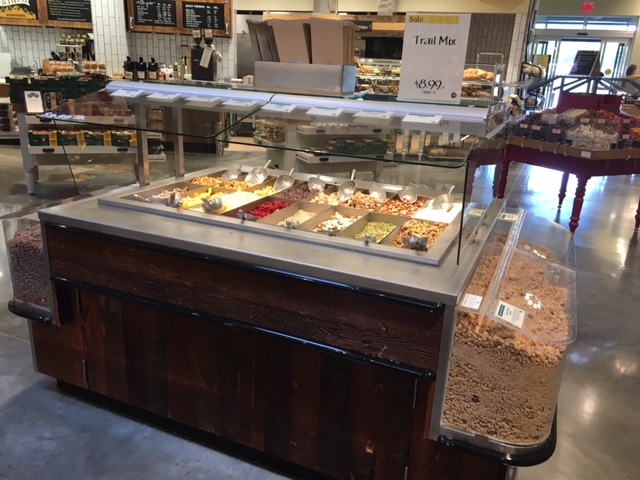 If you shop at Whole Foods, you’ve probably seen the Trail Mix Bar that they have. The bar has plenty of different of ingredients, and you can customize your own mixture to your liking. Of course these recipes can be changed to your own liking. For a nice tropical mix: Cashews, Brazil nuts, dried mango, coconut flakes, banana chips. For a popcorn mix: Popped popcorn (unsalted or salted, your choice! ), roasted almonds or peanuts, dried banana chips and dried cranberries. For your regular ol’ granola trail mix: Granola, dried banana chips, sweetened chocolate chips, roasted peanuts, and chopped dried papaya. For s’mores like mix: Golden Grahams cereal, semisweet chocolate chips, and marshmallows. If you want to you can also add some salted peanuts to it too. Teddy Graham trail mix: Peanut butter Cheerios, Teddy Grahams (chocolate or honey), mini pretzels, M&M’s, yogurt covered raisins, and a box of Raisinets. The bar currently is $8.99 per pound. Every Whole Foods has their own version of this trail mix bar, most of these ingredients above can be found here too! If it’s not at the bar, it can be found in the store. Whole Foods also has an event page! On the Whole Foods website, you can go onto their event page to see what type of events they are having for that month. It is updated every month with different events. You can also change which location you are looking at to the one closest to you.